Ever since The Vaccines released their first album in 2011 they keep writing songs that are inviting to sing along to. That's why the band are a welcome guest at festivals where they can make any crowd jump around. We were promised a new sound on their second record, which in the end was only partly true. On their third album English Graffiti the quartet is supposed to have chosen another direction once again. This time the lads do keep their promise, since there truly is a new sound in the eleven tracks. You can hear this very well in 'Minimal Affection' where besides the obvious The Strokes hook it has more of a synth rock vibe to it, with some Duran Duran mixed in here and there. The songs 'Dream Lover' and 'Give Me A Sign' could have been taken from an Oasis or Noel Gallagher album and are actual songs that have a pleasant ring to it. The tracks are not really meant to go wild on, although they do settle themselves in your head. It doesn't mean jumping around and yelling along isn't possible at all, since there are still a number of tracks on the record that are great dance tunes. 'Handsome' with the insane Kung Fu video and '20/20' are typical catchy The Vaccines songs. But it's remarkable how coherent and more tight the band sounds and how rich the production of the tracks is, that carry subtle electronic elements regularly and give it a more poppy sound. The band also is looking for more quiet moments, which give the songs more air and make them more powerful. 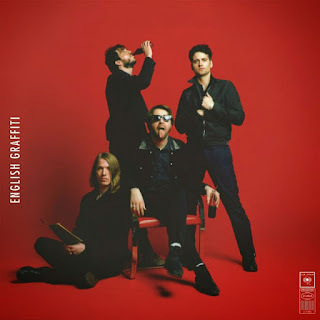 English Grafitti is a surprisingly strong record that shows The Vaccines are open for other influences and that they have matured some more, without losing their edge. Therefore I can forgive them for the weary song 'Want You So Bad'. In this shape the band are able to fire up many a festival crowd in years to come. Listen to 'English Graffiti' on Spotify.